In an earlier grandadscience post (July,2009), I shared how grandson Joshua and granddaughter Jordann observed, measured, and graphed the increase in length of two toy animals made of polyacrylamide, the water-absorbing polymer used in diapers. These animals will dramatically increase in size when immersed in water for several days. I call these toys, water-grow animals. The alligator pictured above will fill a bathtub. We know, because the kids kept one in grandmother math's bathtub for two weeks! 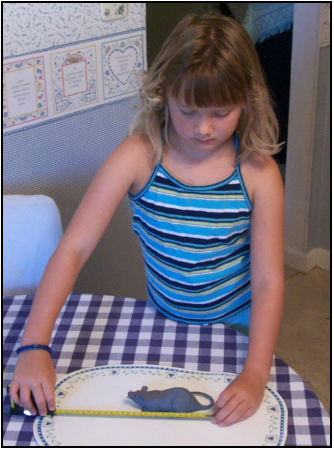 The kids had a lot of fun with the activity and, during a late August visit, were eager to repeat it. Grandmother math keeps a menagerie of these animals and the kids agreed to use a gray rat for the new activity. 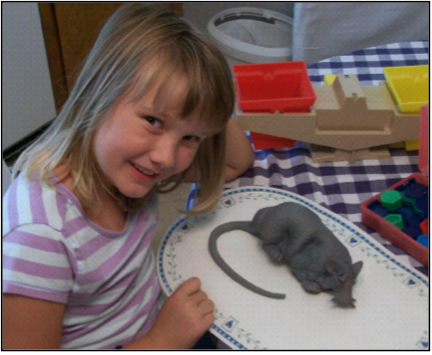 Jordann is eager to get started and begins by measuring the length of the rat. 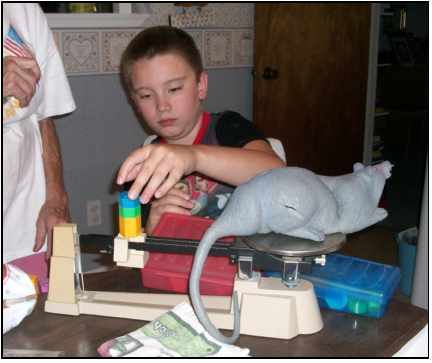 Grandmother math decided to add mass-measurement to the activity so Jordann is shown below using a balance to measure the mass of the rat. 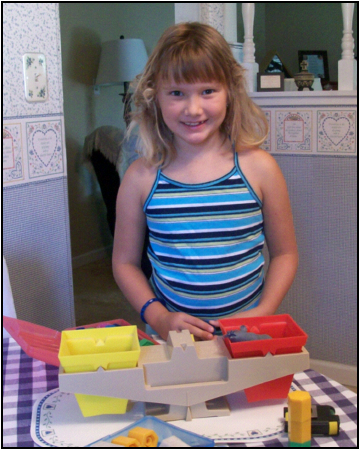 Notice that the rat sits snugly in the red bucket of the balance, That smile comes from adding the right number of mass units to the yellow bucket to balance the rat. The rat was then placed in a bucket of water. Every morning, grandmother math made time for the kids to observe, measure, record, and graph, the length and mass of the rat. After a few days, the rat had grown to an ominous size (for a rat)! The rat had also grown to the point it would barely fit in the bucket on the balance! 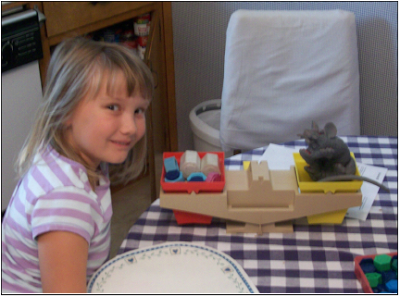 Notice the number and size of the mass units in the red bucket needed to balance the rat! After a day or two, the mass of the rat exceeded the range of the balance so Joshua improvised what problem-solvers and engineers call a work-around. The following day the kids had to return home and they took the rat, wrapped in a towel, with them. Joshua starts the fifth grade next year and Jordann will be in the fourth grade. If the kids are interested, they will do the activity one more time, measuring and recording the mass and length, as in past activities, but adding width, and height measurements. Doing so will allow grandmother math to talk about proportional growth which explains why the animals maintain their shape and don't become distorted. 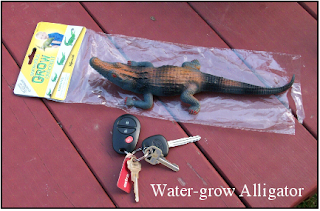 Water-grow animals can be purchased at most large retail outlets. If, like grandadscience, you like the convenience of ordering online, the following link has a large selection and good prices for water-grow animals.